It's time to find a better deal for players and teams. If you’ve been following the discussion surrounding League of Legends lately, you’ll know that things have gotten intense. This is down to issues in the competitive scene that have been brewing for a long time. They’re largely financial in nature: we touched on why teams are panicked about relegations and the possibility of being bumped down to the Challenger scene a couple of weeks back, and as bigger investors move into the scene, the stakes get higher and higher. Let’s go over what exactly inspired this controversy before we talk about the developments and fallout, because it’s crucial to understand what’s on the line. While the spectacle and wonder of the LCS goes off without a hitch, most teams are losing money. In the case of teams like the Immortals or Echo Fox, they know they’re losing money, and that’s part of the gamble. These teams are working to pick up sponsors and fanbases, hoping that as the scene grows, they can make their investment back. There are a few problems with this model. One, teams can lose everything through relegations. Two, teams currently don’t have many ways to make a profit. Riot pays out a stipend that has only increased to allow for coaches, sponsors are hesitant to buy into a system where many ways for them to advertise themselves are prohibited, and teams are forced to work on content creation and other methods of income, which increases burnout and puts an undue burden on teams to work hard or risk becoming financially unviable. Christopher “MonteCristo” Mykles produced an excellent video that dives into all of these issues in detail. Despite these problems, the League community was overall pretty happy. People were excited for the Baker Pantheon skin and the Yorick rework. The current debate sprung up when TSM’s Andy “Reginald” Dinh gave an interview with William “Scarra” Li. The interview inspired discussion about pre-tournament patches: there have been the recent lane swap changes, and the Juggernaut class update that predated Worlds. Reginald was openly critical of Riot on multiple fronts: their patch strategy, player burnout, and incoming revenue. It’s a fascinating interview to watch, and it’s no surprise that it garnered interest on the League of Legends subreddit. Here’s where things go to hell: Riot co-founder Marc “Tryndamere” Merrill responded with a comment on the Reddit thread. The original has since been edited, but the original text exists in screenshots. In short, he called Reginald out for investing in other games, underpaying his talent, and overall suggested that the problems with patching could be solved by team owners investing in the right talent, even if some patches had been “suboptimal”. Tryndamere’s comment has been torn apart, and rightfully so. The original text was glib, rude, and unnecessary. The entire thing had the odd air of an explosion at Thanksgiving dinner between family members who had been suppressing annoyances for far too long. MonteCristo made another in-depth video that takes the comment apart line by line. Reginald has given another articulate response that attacks Tryndamere’s points. For a moment, it looked as though the League discourse had turned into a blood sport. There was a brief moment where it looked like the finer points of the debate might get lost in ugly comments, memes and the usual troublesome signal-to-noise ratio that pops up around esports dialogue. This was a time when firm and decisive action was needed, and Riot has often been critiqued for their failure to take that action. 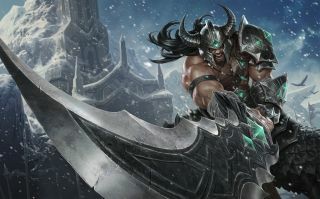 Tryndamere responded to Reginald, conceding many of his original points, and clarifying the issues. It looked like a frustrating stalemate. “Of course we agree on the issues,” is an easy thing to say when the entire community is at your throat, and it’s all too easy to follow it up with “and we’ll start working on them.” James “Obscurica” Chen shared these frustrations, advocating for a road map and immediate progress. Marc, I agree that these urgent issues need to be addressed immediately. There is a detailed proposal signed by NA LCS teams and players headed to your inbox today. We'll solve these problems together. Other team owners and players have all banded together under the #LCSForever hashtag. It was the kind of moment that heroic montage music was made for. HotshotGG stepped up, tweeting in response to Reginald: ”We've been rivals since the beginning. Glad to join forces to make LCS the best it can be.” The leaders of C9, Immortals, Liquid, and Apex all stood up, players cheered, experts wondered what this could herald... it was a storybook moment. It’s painfully easy to be the cynic here, even if that might not be the right call. For so long, the dialogue around esports has been centered around passion. Riot talk about running the LCS and growing esports based out of their love of the game. Even now, in the face of some very authentic and real talk such as the above MonteCristo video discussing caster pay and NME’s Robert "Chachi" Stemmler’s long look at how NME struggled with the LCS, the conversation has been steered back towards passion and optimism. Riot is a massive company with multiple departments who have all contributed to the current issues. When (or if, if you’re a skeptic) change comes, it’ll need to go through that same complex system. The NA LCS may benefit, but what of the EU LCS? How long will it take for change to go through, and how much will the process dilute it?